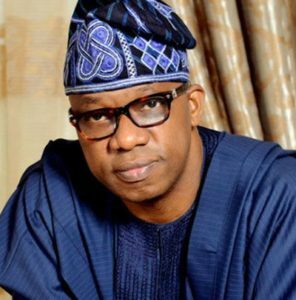 Winner of the March 9, gubernatorial election in Ogun state, Prince Adedapo Abiodun, on Sunday declared that if some “men were God,” he would not have become the Governor-elect of the state. Abiodun who revealed that what had kept him going in the journey of life despite daunting challenges is his absolute and unshakeable faith in God, saying such faith was anchored on the message of Christ in Mark 11:23, which assured that an unwavering faith could relocate a mountain from one point to another. The successful entrepreneur, oil magnate and real estate player made this known at St. James Anglican Church, Iperu, his home town, during a Thanksgiving Service to appreciate Almighty God for protection and victory at the gubernatorial poll in the Gateway state. The Governor-elect on the ticket of the All Progressives Congress (APC), recalled that he was heartbroken in 2015 when he lost in the contest for the Ogun East senatorial seat but kept pressing forward undaunted because an inner voice was telling him he still has a vision yet to be accomplished. He pledged to run an equitable, just, accountable and a transparent government which would create a public and private partnership for the benefits of Ogun state, the citizens and residents. Abiodun said: “my victory has a hand of God. My friends and people around me were asking, ‘Dapo, what has kept you going ahead in your ambition? What has propelled you? But I remained focus in God and unshakeable. For you to succeed, you don’t have to have doubts in your mind. “Today, what I want you to take home from here is that we should never give up because many times when we meet disappointment, it is just an avenue to close a window for a double door to be opened. “I want to assure you that we would lead an equitable and a transparent government which will create a public , private partnership for all, so help me God. “I want to thank you all for been here today. We would have postponed this thanksgiving service until after inauguration but we want to quickly acknowledge the fact that this is an act of God. In his sermon, the Archbishop Ecclesiastical Province of Lagos, Olusina Fape, said it is God that made Abiodun Governor-elect for a purpose in the state. Fape said Abiodun’s value could only be determined when he begins to effect real and positive changes in the lives Ogun people and the state. He advised the Governor-elect to shun sycophants and surround himself with people of integrity when assembling members of his cabinet, praying that God would help him to succeed. The archbishop also advised him not to allow himself to be carried away by the excitement and euphoria of electoral victory, lest he forgets those who God used to help him to get to the position of a governor after being sworn-in. Prominent personalities at the service include former Ogun and Ekiti State governors Gbenga Daniel, Niyi Adebayo, Kwara State Governor-elect Abdulraheem Razaq, Senators Buruji Kashamu, Gbenga Kaka, Gbolahan Dada, Biyi Durojaiye, Senator Solomon Adeola (aka Yayi), Prof. Toyin Ashiru and Otunba Bimbo Ashiru. Also in attendance were Dr. Femi Majekodunmi, Prince Segun Adesegun, Chief Toyin Okeowo, Ogun West Senator-elect Chief Tolu Odebiyi, Otunba Rotimi Paseda, Kayode Oladele, royal fathers and others. This entry was posted in Belief, Christianity, Faith, News, Politics and tagged APC, Dapo Abiodun, Ogun State. Bookmark the permalink.